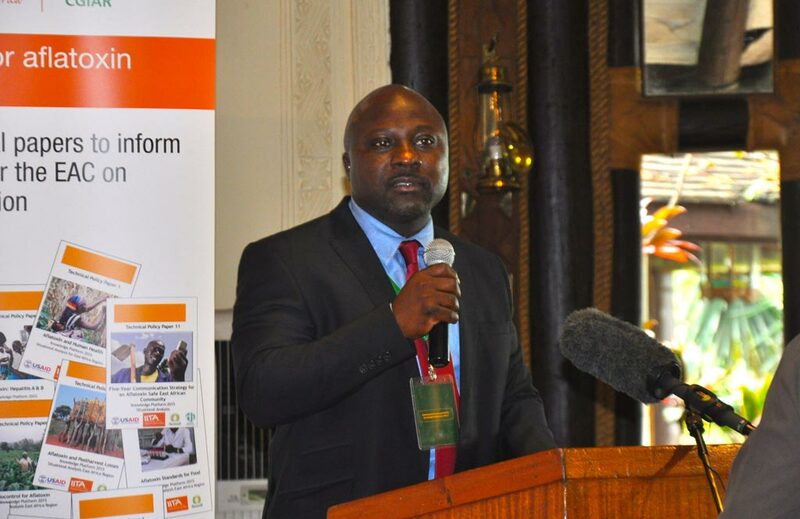 This was the general conclusion of a three-hour symposium organized by IITA and several other stakeholders to discuss the ongoing efforts and progress made to reduce aflatoxin contamination on key staple crops in Africa and how the various stakeholders can synergize and strengthen these efforts. 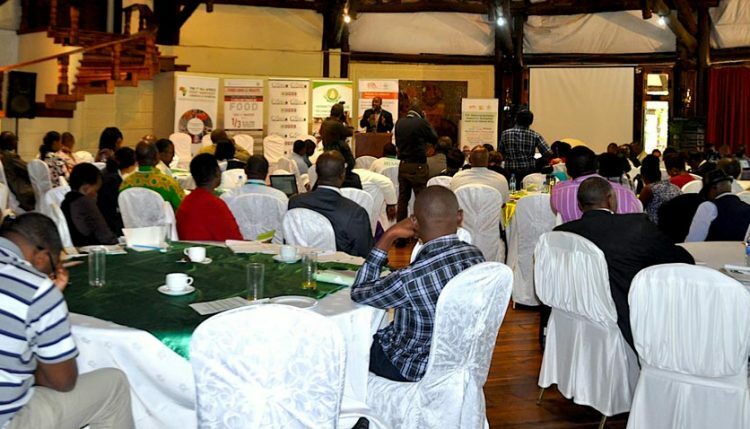 This was held on 30 March at the first All Africa Postharvest Congress & Exhibition. The session titled “Are we winning or losing the fight against aflatoxins?” combined presentations by various partners on the ongoing initiatives to control aflatoxins and a panel discussion on the lessons learned and next steps in efforts to reduce aflatoxin contamination and its negative effects. It attracted over 200 participants. An over view of the well-attended parallel session with over 200 participants. The session started with opening remarks from ATTC Managing Director, Abdou Konlambigue, who emphasized the urgent need to work together to reduce aflatoxin contamination in food and feed to safeguard the harvest, health, and incomes of people in Africa. He said the aflatoxin challenge was too big and complex for any single organization to solve alone hence the need for this symposium to learn from and join forces with other players in the continent. This was followed by a presentation by Liz Ogutu, Senior Officer for Strategy and Operations at the African Union’s Partnership for Aflatoxin Control in Africa (PACA). She highlighted the gravity of aflatoxin contamination problems as she shared the findings of studies that showed high levels of contamination in grains and milk in the market in many African countries and in the blood of children. She also outlined the activities of the pan-African initiative in promoting appropriate policies and technologies across the continent. 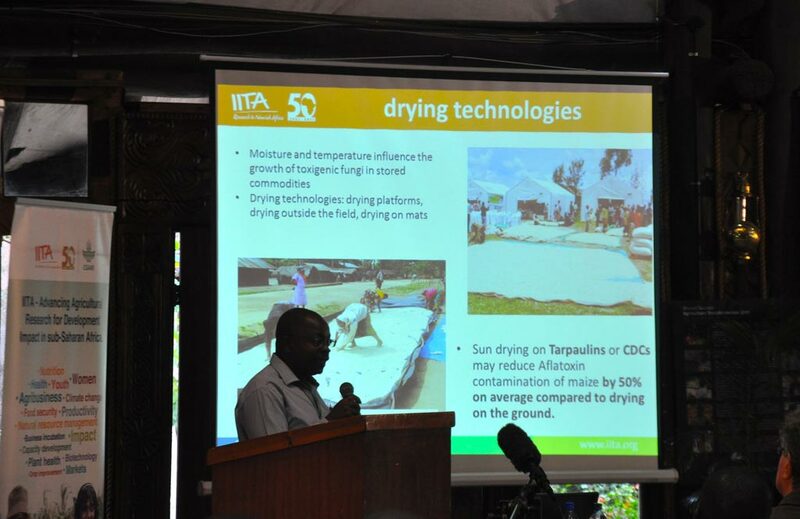 Other speakers were George Mahuku, a plant pathologist at IITA, who presented on various ways to reduce aflatoxin contamination in staple crops and in particular on appropriate postharvest handling by smallholders. 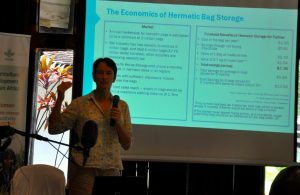 Vivian Hoffman from the International Food Policy Research Institute (IFPRI) presented on the challenges faced in promoting existing technologies for reducing aflatoxin contamination to smallholders. Hoffman pointed out that for farmers to adopt any technology, its economic benefits must be evident. 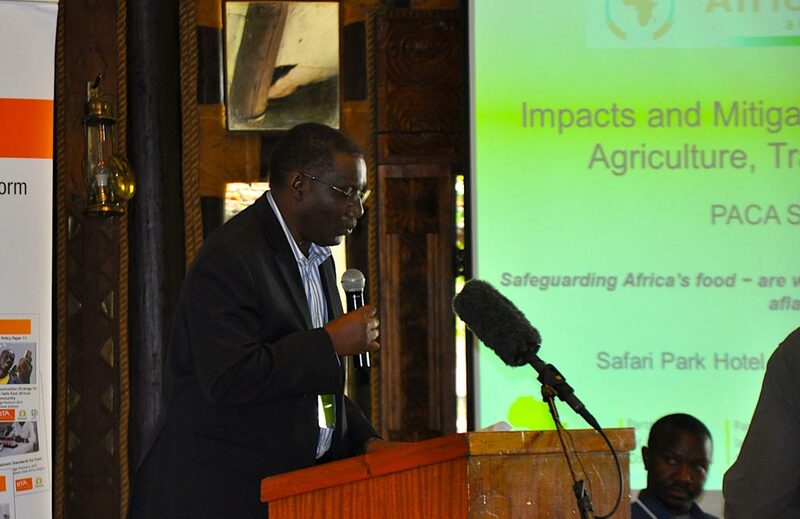 Stanley Kimereh, a program officer with the United Nations Food and Agriculture Organization, spoke on lessons learned and the outcomes of their campaign to create awareness on aflatoxin mitigation in Kenya. 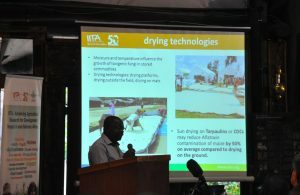 The second part of the symposium presentations looked at efforts to scale up appropriate technologies to reduce aflatoxin contamination. 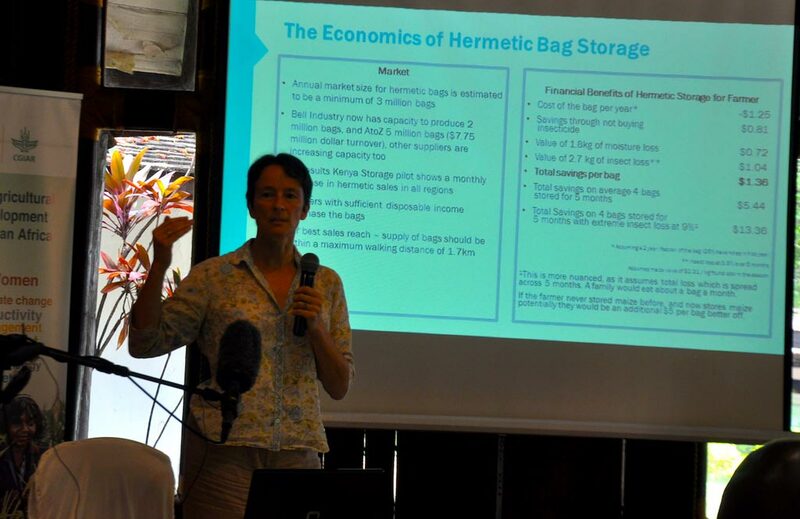 Presentations were made by Sophie Walker from ACDI–VOCA; JB Cordaro from Mars Incorporated; Asenugu Idowu from Agribusiness Supplies Ltd, Nigeria; and Raphael Wanjogu, Chief Research Officer at the National Irrigation Board, Kenya. Idowu and Wanjogu shared on their successes in promoting and using Aflasafe―the safe biocontrol product for aflatoxin management developed by IITA and partners―in Nigeria and Kenya. According to Wanjogu, the technology had successfully reduced aflatoxin contamination in the major government irrigation schemes and the board will continue to use Aflasafe across all its major irrigation schemes. The session was facilitated by David Githang’a, a pediatrician and cardiologist and also a former president of the Pediatrics Association of Kenya. This was followed by a lively panel discussion on lessons learned and building consensus on the next steps in reducing aflatoxin contamination. The panelists included Chebii Kilel, Head of Food Crops Directorate, Agriculture, Fisheries and Food Authority, Kenya; Martha Byanyima, a lead expert on Sanitary and Phytosanitary measures; David Githang’a, a medical doctor; Kevin Manyara, Operations Manager, Cargill; and Delia Grace from the International Livestock Research Institute (ILRI) and flagship leader for the CGIAR Research Program on Agriculture Nutrition and Health. Some of the areas highlighted from the discussions were on the need for governments to harmonize policies on various aspects of aflatoxin control efforts including testing of the contaminant in grains such as maize, and standardization of testing protocols. There was an urgent call to create awareness and address the impact of aflatoxin on children which was irreversible and to support farmers to access proven technologies for reducing aflatoxins. The panel discussion was chaired by Gerald Makau Masila, the Executive Director, Eastern Africa Grain Council.